When your garden colors begin to fade in the fall, and you just aren't ready for plain green landscape, plant an Aster! 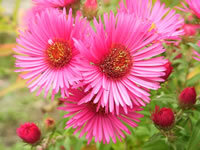 Asters are great for late summer and fall bloom. The most popular variety is the New England Aster (Aster novae-angliae). It's bright 1 1/2 inch flowers bloom prolifically from August through October atop a two to four foot plant. You will often see native Aster varieties growing wild in almost any environment from the tropics to the coldest regions of the north in habitats ranging from extremely arid deserts to bogs. 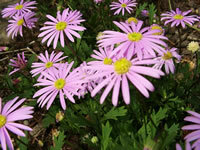 The Aster produces large clusters of delicate daisy-like flowers in white, purple, lavender, pink or red. Depending on the particular species, Aster plants are hardy in USDA zones 4 through 9. 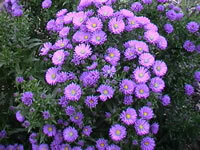 Asters should be planted in moist well-drained soil in full sun, but they will tolerate light shading. The plants form broad bushy clumps, so plant them at least 18 inches apart. Mature clumps will need to be divided every 3-4 years, in the early spring, or late fall after the flowering has finished. Pinch back the tops by 6-8 inches at least once during the summer, to create a bushier plant and to prolong the fall bloom. This pinching MUST be done prior to mid July, or it will have an opposite effect, and blooming will be reduced. Asters can be propagated by dividing existing clumps or grown from seed sown indoors at about 70° F.
Seeds can also be sown directly into the garden after all frost danger has passed. Germination takes anywhere from 15 to 30 days, depending on the temperature. Annual varieties of Asters require the same basic care, but should not be planted in the same spot the following year, to prevent plant diseases such as Aster wilt. Sow seeds directly into the garden in early spring, when all frost danger has passed. Barely cover the seeds with 1/8 inch of fine soil. Thin the young plants to 12 to 15 inches apart when they are three inches tall. Successive plantings will ensure a longer blooming season. Promptly remove any spent flowers to help ensure blooming throughout the summer.